It was a busy weekend for me- I received orders for lots, and lots of cards and This is one of the cards I received an order for 3 and only had 1 on hand. This sweet image is from Art Impressions and I especially love the sentiment. I colored with copics and the papers are from My Minds Eye and The Paper Studios. Your card is so cute. It is amazing what a few different colors do to an image. Thanks for participating in the challenge at Mema's Crafts. I love all my AI stamps and this one of yours is no exception. Know you are a busy lady and can't keep up with what state you are in from week to week...haha And, how in the world you have had time to make more cards! Sooooo Cute!! Love the stitched you made. Thanks for sharing your card at Love To Scrap! Challenge Blog! Hope to see you again soon!! HUGS! A fun card and sentiment, love the colours. Thanks for sharing with us at Craft Your Passion and hope to see you again. So cute. Love the fun sentiment too. I've celebrated 29 a few times (more than I care to admit). Your card did give me a smile today. Thank you. Thanks for playing along with us this week at CYP. Good luck. Just love these.Great image and sentiment.Like how you've swapped the colours over on each.Thanks for joining us at Craft Your Passion.Hope to see you again next week. 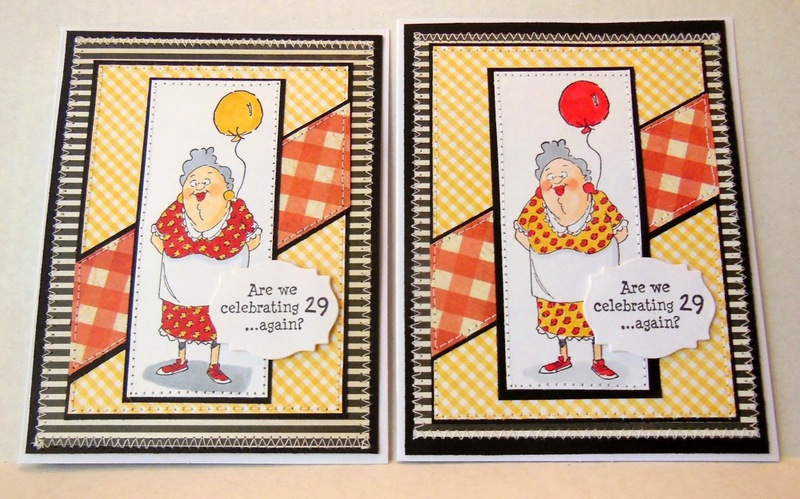 Two fabulous cards, such fun images and sentiments.